A cumulative chart combining the sales of this year’s solo female artists who promoted in 2015 has been published, revealing who was the most successful in their promotions this year. 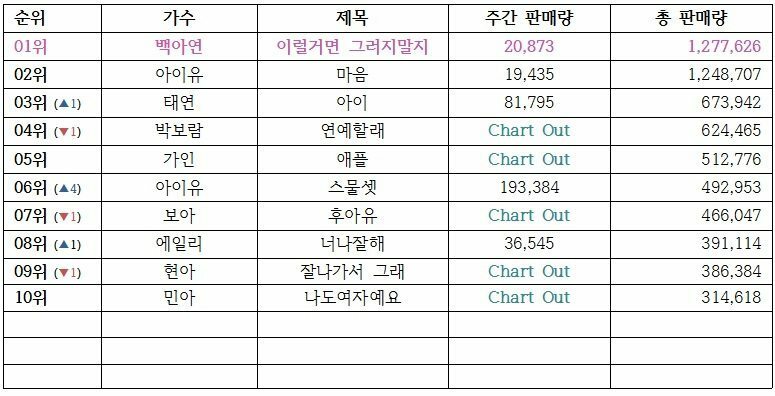 On online community board Instiz, a netizen published a post titled “Solo female rankings for this year” and revealed the chart that combined weekly and total sales for which track. Topping the chart was JYP Entertainment female artist Baek A Yeon with “Shouldn’t Have” with 1,277,626 total cumulative sales for this year. While “Shouldn’t Have” did not originally become popular upon release, it began picking up popularity about two weeks afterwards which enabled her to begin official promotions that weren’t scheduled at first, topping the digital charts for at least seven weeks despite the tough competition against BIGBANG and EXO. Coming in second is IU with her track “Heart” which she released during the airing of her KBS2 variety-drama Producer starring herself, Kim Soo Hyun, Gong Hyo Jin, and Cha Tae Hyun. The chart achieved an all-kill status upon release. Completing third place is Girls’ Generation‘s Taeyeon who made her solo debut in early October with her title track “I” featuring Verbal Jint as the leading rapper. She has achieved an all-kill as well upon release and continues to chart on digital charts in the Top 15.